In order to start your project on the right track, it is a good idea to organize your files and directories properly. To make it easier to remember what each project, layer, drawing or colour palette is, name your file with a relevant name representing the content of your project. Make sure to give it a name which easily identifies the project, such as JumpingFrog. That way, when you have several projects, you can locate specific ones more easily. We recommend that you name your scene using alphanumeric characters: a to z, 0 to 9 and underscore ( _ ). Avoid spaces in the file names. Try to provide the maximum amount of information for future identification, which helps ensure that you do not mix up elements and lose information. When you create your project, you must save it somewhere. It is a good idea to create a folder on your hard drive to contain all the elements of your project. Keeping everything together in one place is always useful for retrieving scenes, sounds, artwork, or reference material. 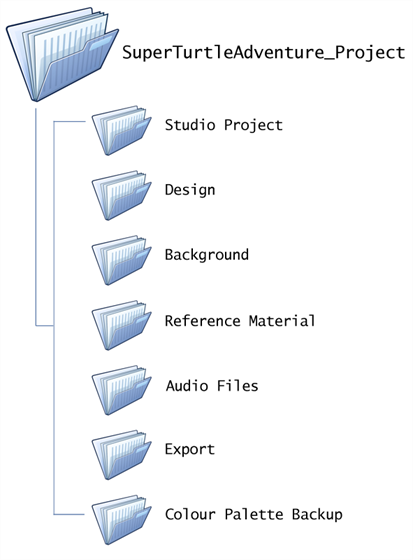 There are many ways to structure your project folder. Here is an example you could use to start. Before you save any elements in your production, you should decide on a project name, which should reflect the content or title. Use the name to create your main folder on your local hard drive, where you will save all your production elements. For example, the main directory could be called SuperTurtleAdventure_Project. • Studio Project: In this folder, you can store the actual Toon Boom Studio projects. • Design: In this folder, you can store designs or any development drawings you have done for your project either on paper or in another software. You can scan your drawings and store them here. • Background: If you drew some backgrounds and painted them in a third party software or took some photographs to use as backgrounds in your scene, store them here. • Reference Material: To get inspiration for your project or design your characters, you can search the Internet to find pictures related to your project and store them here. You could also take photos with a camera and store them in this folder. • Audio Files: Use Store any music or dialogue tracks you will use in your movie in this folder. • Export: Once a scene or your project is ready, you will export it into a movie format or image sequence. You can store all your exported material in this folder. • Colour Palette Backup: When you create characters and background, you will create a colour palette for each one of them. It is a good idea to export them from your project and store them in this folder as a backup in case you modify the colours by accident.